Financial Hero – My Parents! Why are MY PARENTS www.JosephSangl.com Financial Heroes? Because my Mom & Dad taught me a lot about working hard, investing, and running a business. My father started his own home-building business in the early 60s and managed to run that business all the way to retirement. That is NOT a small accomplishment! My mother ran the home economy. We had a garden that probably totaled over an acre of land. I remember days where we picked BUSHELS of green beans in the morning, snapped them all through the afternoon, and canned them all night. Some days we would can over 100 quarts of green beans at a time! She made clothes. She bargain-shopped. She cooked nearly every meal from scratch (cheapest way to make a meal – also the tastiest). My parents managed to support a family of SIX boys through this business and develop some sound investments that prepared themselves well for retirement. 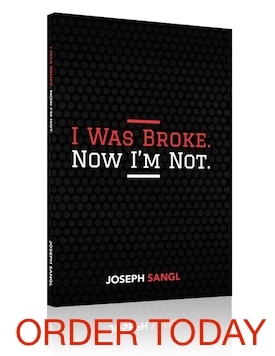 It was my father who gave me the book written by another www.JosephSangl.com Financial Hero, David Chilton, The Wealthy Barber, to read. Through it I learned about the POWER of compound interest! My parents never splurged on anything, but we ALWAYS went on a family vacation every single year. We also had some motorcycles, dirtbikes, bikes, canoes, and fishing poles that ensured that we could have fun through the year. Thank you, Mom & Dad, for instilling sound financial principles in me and showing me the importance of working hard! You are officially www.JosephSangl.com Financial Heroes! I also honor your parents. What wonderful people! While I have always been known as “Rich”, two people have always addressed me differently. My mother has always called me “Richard” and your dad still calls me “Richie”; and I don’t mind it a bit because as a kid I was intrigued with “Richie Rich” comic books. Picking corn and snapping beans…me too! But today, not many have that privilege. I remember when corn was always “hand shucked”, as Bill Murray in “What About Bob?” would say. No one begins a long journey without knowing in advance their destination. Financial planning offers you a coordinated and comprehensive approach to achieving your personal, family and financial goals.